Managers and staff were unfriendly and often not there. Bathrooms were not clean. Missing signs at the bridge so it's easy to miss the turnoff. Roads need paving to the campground--bumpy. Tree branches hanging down along the way. My positive comment: there is a beautiful church by the lake. We camped at Rippling Waters Church Of God Campground in a Fifth Wheel. One of the quietest parks I have ever stayed. A beautiful setting on two ponds. Though the county road goes right through the center of the campground there is virtually no offensive noise and our site was the close and right next to the road. I would have stayed here much longer if only there was WiFi available. Even ATT cell service was spotty so using the Iphone HotSpot was not an option. If it had WiFi I probably would have given a Ten rating. If Internet access is not important to you then I would suggest that you don't miss this park. We camped at Rippling Waters Church Of God Campground in a Motorhome. The drive to the park is long, narrow, curvy and filled with low overhanging trees. Low tree limbs in the park also attempted to green stripe our RV. Office staff was nice. There are many seasonal campers. Our site was in the pull through section. It had gravel drive and some green space between sites. Park is very quiet except for barking dogs and scenic. Probably would not camp again because of difficult drive for a long RV. We camped at Rippling Waters Church Of God Campground in a Motorhome. This campground was lovely, quiet and serene. It is about 4 1/2 miles off I-77, but is easy off and on. Most of the 4 1/2 miles is a narrow, winding road, however we navigated it with a dually pulling a 40 ft fifth wheel with no problem. It was well worth it! We called ahead and reserved a pull through with full hookups. We were well pleased with the site and with the friendly reception. 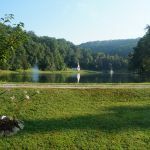 The campground has a beautiful lake with fountains and picturesque views. We would stop there again. We camped at Rippling Waters Church Of God Campground in a Fifth Wheel. The road to the campground is narrow and with a few small hills but you can get there with no problems as long as you go slow. The pull-thru sites are very large and flat. The GC was very clean and quite. The grounds of the CG are very nice. It is only about 20 miles to Charleston from here and is the closest place we could find. It's location is good for seeing the area. We would stay here again if we were passing through because the pull-thru sites are large enough that you don't have to unhook your tow. We camped at Rippling Waters Church Of God Campground in a Motorhome. Yup: the road to the CG is narrow, windy, but well paved. DW closed her eyes a couple of times, but it really is not a problem traveling at a slow rate. The pull-through sites are fine, not much space between sites. Stone surface, some grass. They just put sewer line to the pull-through area. We did pick up some stations on our antenna and the Wi-Fi was fine. Overall a nice overnight stop. We camped at Rippling Waters Church Of God Campground in a Motorhome. We camped here for a conference in Charleston, WV. There are not any campgrounds in Charleston that would accommodate our RV. This is a pleasant campground with a couple of lakes and a beautiful little chapel on one of the lakes. Cell phone service was marginal and Wi-Fi was only available at the office. The office was only partly manned so contact the staff was difficult. It is about a 30 minute drive to Charleston. Getting to the campground is a challenge. There is a narrow 2 lane (?) road that winds through the hills. There are many tree limbs that will hit the RV if you are not careful. It is a smoke free, alcohol free campground. We camped at Rippling Waters Church Of God Campground in a Motorhome. I read all the comments about the road to this park and almost passed it by. But as it is really the only campground in the area ( north on rt 77) and it was late afternoon we went for it...Boy, am I glad we did! This is a beautiful campground , beautiful grounds with a pond and a little chapel. Most sites are wooded although ours (a large pull-through ) was in a field setting. I think the comments about the road are a little over exaggerated . Yes, it is a narrow winding road , but it is paved and in good condition. You do have to be careful of the occasionial car coming the other way. We were just there for the night and had a pull through site that was easy in and easy out... This is really a nice campground and I would definitely stay again. We camped at Rippling Waters Church Of God Campground in a Motorhome. Three miles off the highway but it's a nice overnight stay. Very friendly staff. This is a Christian camp so certain codes of behavior are in place. If you have faith you will love the peaceful setting. A picturesque chapel on a small lake with water fountains. It's pretty during the day, but breathtaking at night with lights shining on the chapel and fountains. We felt in the presence of God. Also home to lots of fulltimers. We enjoyed our one night layover here. Would go back. We camped at Rippling Waters Church Of God Campground in a Motorhome. This is a beautiful park with a couple of lakes and fountains. The road to it is a little tight and curvy but we managed it slowly with a 40' motorhome. We could not get any kind of TV signal or Wi-Fi but didn't see that as a problem as we were here only 2 nights. The site we had was kind of isolated but the front yard was a lake. We would stay here again. We camped at Rippling Waters Church Of God Campground in a Motorhome. The park is excellent as is the staff. The 4 mile road to it, however, is a sidewalk with a double yellow line so medium to big rigs could use a pilot car because you can't stay on your side of the road and keep your rig out of the ditches. The Lakes are small but very pleasing to see. FIshing is good but catch/release. Wifi, though mentioned, is only available near the office. Though there is no cable, digital over the air reception gets about 8 channels. Most sites are smaller, but spaced ok. Most big pull throughs can handle any sized rig and are 50/30amp, but dont have sewer. We are HDTers and 65' x 13' 4" when travelling. Quiet, peaceful setting and though there are a lot of rigs in place full time, they are not occupied all the time. Great Place except for bad WV roads. We camped at Rippling Waters Church Of God Campground in a Fifth Wheel. After reading previous posts, I wasn't surprised by the narrow winding road leading to this park, but the drive was well worth it. What a beautiful setting for a RV park. There seemed to be a lot of permanent units, some old but also many newer ones. There are two lakes with fountains, and a beautiful little (active) church across the water. As we walked our dog in the late afternoon, we saw two white tailed deers. The restrooms and showers were modern and clean. We would definitely stay here again. We camped at Rippling Waters Church Of God Campground in a Fifth Wheel.